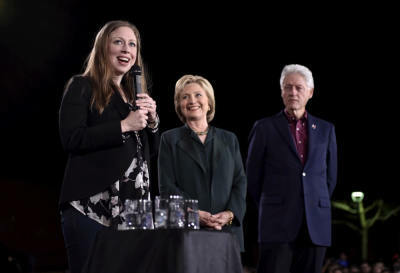 Last month, Chelsea Clinton generated a firestorm of controversy with comments at a "Rise up for Roe" rally in Manhattan about the economic impact of the Roe v. Wade decision. Clinton stated that "American women entering the labor force from 1973 to 2009 added three and a half trillion dollars to our economy." Her remarks were widely criticized by a number of conservative media outlets including The Federalist, National Review, Breitbart, Townhall.com, and CNSNews.com. Some commentators disagreed with her economic logic. Others rightly felt that no amount of economic prosperity justified removing legal protections for the unborn. In the aftermath of this backlash, Clinton took to social media to defend herself. On Twitter she responded to both a Newsweek article and tweets by conservative pundits Erick Erickson and Dinesh D'Souza. Clinton claimed that her remarks were being taken out of context. Specifically, she steered the conversation away from the wealth creation since Roe v. Wade and argued that legalizing abortion created more economic opportunities for women. She tweeted to one woman that "reproductive rights have always been economic rights." In her responses to her online critics, Clinton linked to four studies in an attempt to make the case that legalizing abortion was economically beneficial to women. However, the research she cites fails to advance her argument. Of the four studies, two looked at how access to contraception – not abortion – affected female labor force participation. A third study was a paper published by the Center for American Progress which finds somewhat better economic outcomes for women living in states with greater "reproductive health care access." However, this study simply compares state level averages and fails to consider a number of confounding variables that likely impact the economic well-being of women. Finally, Chelsea cites the recent abortion turnaway study. This study analyzed the life outcomes of a group of women who sought abortions, but were unable to obtain one, often because of the advanced gestational stage of the pregnancy. The study found that women unable to obtain abortions were more likely to live in poverty in the short term. However, after a five-year period, the poverty rates of women who carried their pregnancy to term were almost identical to the group of women who had first-trimester abortions. Overall, these studies fail to make a convincing argument that Roe v. Wade has been economically beneficial for women. August's "Rise up for Roe" rally was likely the first time that Chelsea Clinton publicly spoke in favor of legal abortion and was criticized for it. Unlike many supporters of Roe v. Wade, Clinton did make some effort to respond to her critics. That said, she never engaged the counterargument that falling fertility rates – caused in part by legal abortion – will certainly have negative economic consequences. More tellingly, at no point did Clinton – a mother of two – ever engage her critics on the humanity of unborn children. As such, Chelsea Clinton joins a long list of "pro-choice" public figures who are eager to discuss a range of economic and social issues, but consistently dodge the important issue of legal protection for unborn children.